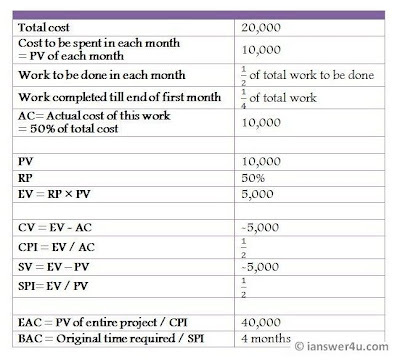 Earned Value Management is one of the most common techniques used to measure the performance of the ongoing project. 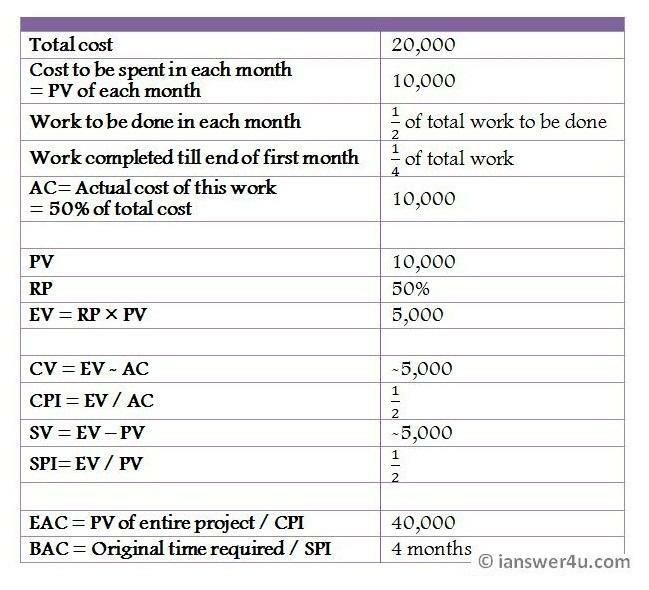 To implement earned value analysis in project management, it is important to first understand the following EVA terms and formulae. Also called Budgeted Cost of Work Scheduled(BCWS), is the cost that is proposed to be utilised on an activity during a specific time frame. Also called Actual Cost of Work Performed(ACWP), is the aggregate cost that is spent on an activity while its execution, during a specific time frame. It is the rate at which the project is progressing. Mathematically, it is the percentage of the work actually completed out of the total work that was scheduled to be completed till that point of time. Also called Budgeted Cost of Work Performed(BCWP), is the estimate of the value of the work completed, on the basis of how much work should have been completed and how much work was actually completed. Consider a project where the work has to be completed in two months in Rs 20,000. Cost breakdown is Rs.10,000 for each month. The work scheduled in each month is half of the total work to be completed. By the end of the first month, the project has completed only 25% of the total work to be completed, but the cost utilised is that of 50% of the total work. This implies that only half of the work scheduled to be completed by the end of the first month has been completed. This implies that we have utilised Rs.10,000(AC) for the work which should have utilised Rs. 5,000(EV) according to our budget. As the name suggests, Cost Variance calculates the deviation between the cost actually incurred and the planned cost. It checks whether we have gone according to our budgeted costs or not. Cost Performance is used to estimate the projected or actual cost of completing the project based on the performance to date. Schedule Variance calculates the deviation between the actual and planned time taken to complete the project or an activity of a project. It checks whether the project has taken more or less time than that of the planned schedule. Schedule Performance Index is used to estimated the projected time to complete the project. Used to find the estimate cost of the project at completion, going by the present performance. Used to find the approximate time required to complete the project, going by the present performance. Take the above example to understand these terms. This indicates that the project which had to be completed in a budget of Rs.20,000 will be completed in Rs.40,000(if the rate of performance is the same). This indicates that the project which had to be completed in 2 months will be completed in 4 months, if the work goes on in the same way. If SV is negative, it means that the activity took more time than planned to complete. After going through the definition, need and terms related to earned value management, I hope you will be able to use this tool properly to rate the performance of your project. Will Earned Value Analysis work for your project? ur answer is clear and very helpful for me to understand earned value analysis.